They say March comes in like a lion and goes out like a lamb. Well the lion got in a late roar and dumped abut 6 inches of heavy wet snow on our area. 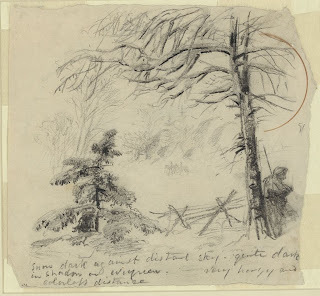 Late snow is unusual for Northern Virginia, but recall that there was a heavy snow storm storm when President Abraham Lincoln made his Easter visit to the Aquia Line in 1863, as well as several other storms that winter. Of course the snow caused the local schools, many businesses, and the Federal Government offices to close down. With an unexpected day off, I tackled several miscellaneous tasks on the Aquia Line. Most of the tasks were in the maintenance and rebuilding category. First, I tuned up several freight cars. Through test operation I found several cars that were derailing in various places. I discovered that some of my cast metal trucks did not have the king pin hole exactly on the center line. This caused the couplers to be offset too much on certain curves. The offset couplers then jam the links and caused derailments by lifting the car and wheels off the rails. The off center problem was due to the rubber mold wearing as I cast the metal parts for the trucks. To fix that problem, I cracked open the offending trucks and replaced the bolster beam with new laser cut parts that had the king pin hole precisely centered. They also had consistent tabs to fit in the slots of the cast metal truck side frames. With these changes, those cars performed much better. 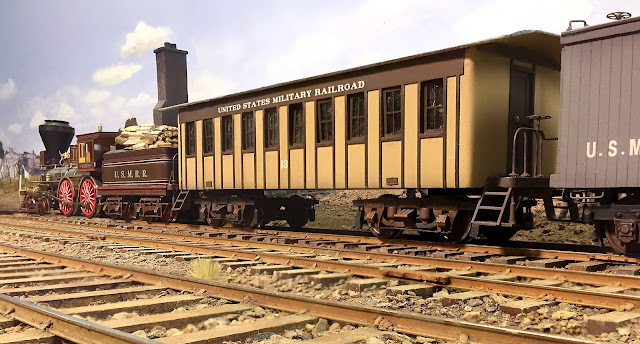 While I was doing freight cars, I also finished up the decals for a new box car. This is now the 28th car on the RR. I also built two more sets of trucks for cars 29 and 30. But I still had some derailment trouble. All three turnouts to the wye at Aquia had problems. These are key turnouts and must work reliably. The easiest to fix was the switch on the Burnside Wharf side of the wye. My operators from last week reported that the stubs were not clearing the stock rails. Sure enough, one stock rail was too long. That was easy to trim. 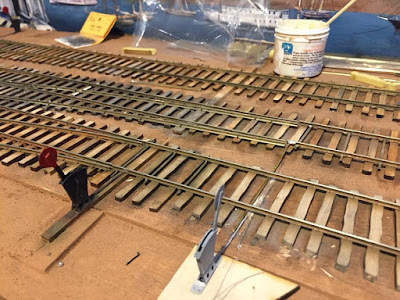 The center wye switch had become tight in gauge after I ballasted the track, probably because I was too enthusiastic with dilute glue and wet-water when I applied the ballast. The excess water caused some of the ties to wrap a little bit. However, I was able to salvage the turnout by slightly re-gauging the track without having to pull the ties and totally re-lay it. The biggest problem was in the south end of the wye. The lead to the turnout was too sharp. While it worked most of the time, certain car-coupler combos still had trouble. The frog was ok, but the lead in the stock rails was the problem. To fix it, I pulled up the stock rails, added three inches to the lead and and re-spiked the track. In the process, I was able to move the switch stand to the foreground, where is it much easier to access. It all works much better now. 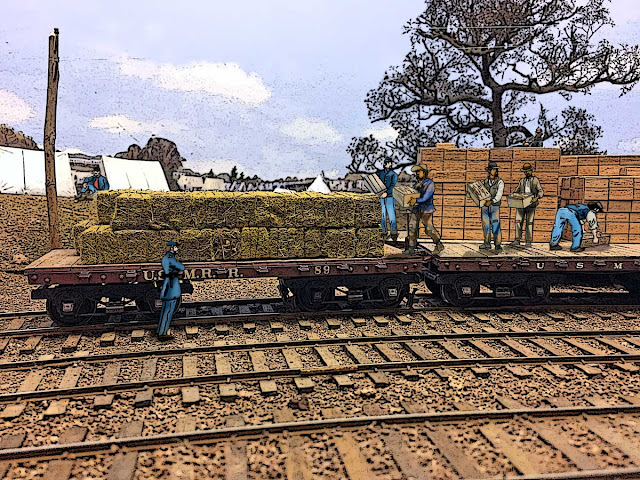 One other niggling problem we had was that certain freight cars interfered with the transfer bridge on the car float. I was able to sand the transfer bridge post in the center that was causing the problem. Most cars now fit, except two flat cars with home made stake pockets. I was able to use my new Proxxon disk sander to take off about .040 inches off each side of the cars. They now fit and the cars still look fine. I recently purchased the Proxxon sander. It has proven itself to be one of the most useful tools in my shop. How I got along without it for so long is a mystery. It's for sale direct from their website with feee shipping. And their price is lower than most discounters, like Amazon. Finally, the USPS brought a package. I guess the, "Neither snow nor rain nor heat nor gloom of night stays these couriers from the swift completion of their appointed rounds" is true. Anyway, the package contained an O scale 2-8-0 2-rail locomotive that Jeremy Drummler purchased for me at the 2018 National O scale Show in Chicago last weekend. Thanks Jeremy! It is shocking to feel how heavy this loco is and how much bigger it is compared to a ACW 4-4-0. The engine weighs 4.1 pounds and the tender is another. Wow. 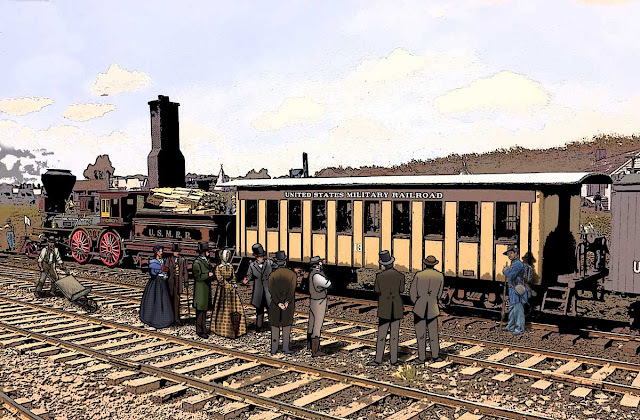 The loco is for a new layout project for my next book. More on that later. We had another successful op session today. This was number 7 on Aquia and 16 for PoLA. Marty McGuirk and his son Matt, Roger Sekera, Gene Nash, Tom Pierpoint, John Barry and Brad Trencamp showed up for duty. Brad ran PoLA solo, while the others ran 3 trains on Aquia using two-man crews. We tried using longer trains for the southward direction and that was a success. We also ran an extra and that works, but because the room is small, two 2-man crews without an extra is probably a better fit. Later in the day John King, Paul Dolkos, Ken Lehman, Mat Robertson, and Reg Mitchell stopped by to visit. Reg got recruited to run the General's special near the end of the session. As usual mom and Alicia made some delicious snacks. For a more complete summary see the video below. 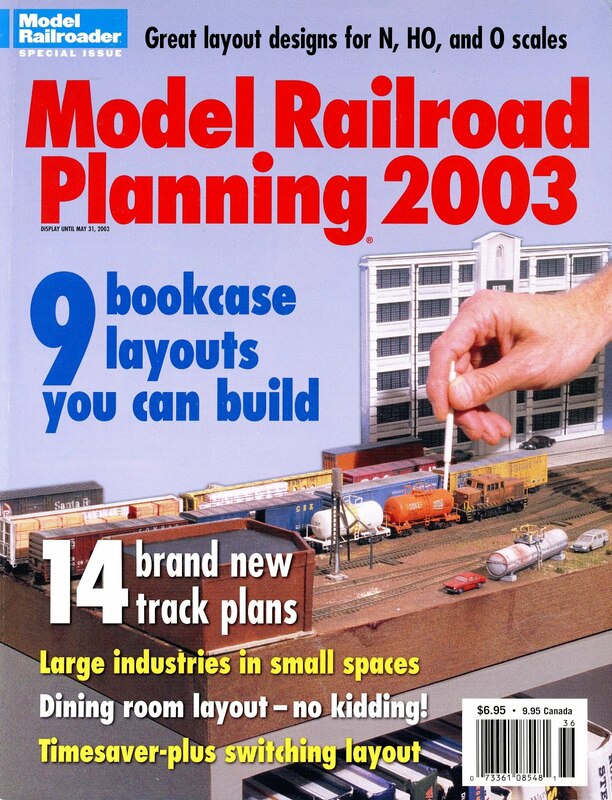 Lance Mindheim's new project N Scale Brooklyn layout reminded me of the Bush Terminal layout I built for a cover shoot for MRP in 2002. I shot slides for the cover, which now, I have no clue where they are. But I do have this scan of the cover. That's my hand in the image too! "In the city known for some of the most famous skyscrapers in the world, the buildings that most fascinated me as a young boy were the warehouses and docks known as the Bush Terminal. As a child growing up in southern Brooklyn, NY during the 1950s and 60s, I had ample opportunity to observe the Bush Terminal, usually from the back seat of my father’s car as we drove past on the elevated Gowanus Expressway. From this lofty position looking over the plains of brownstone apartment roofs my gaze was fixed not on the glittering Manhattan skyscrapers visible in the distance, but on the stark white eight-story concrete warehouses boldly emblazoned with the Bush Terminal logo in high contrast black letters. The seemingly endless maze of identical block structures, connected by bridges and catwalks, with shadowy alleys, crisscrossed by railroad tracks and adjacent to long fingers of piers captured my attention. What went on there I wondered, sometimes with a touch of dread when my young imagination got the best of me." a paper cut out. The white buildings were scratchbuilt from styrene. The layout for this article was the size of a small 3-ft book case. 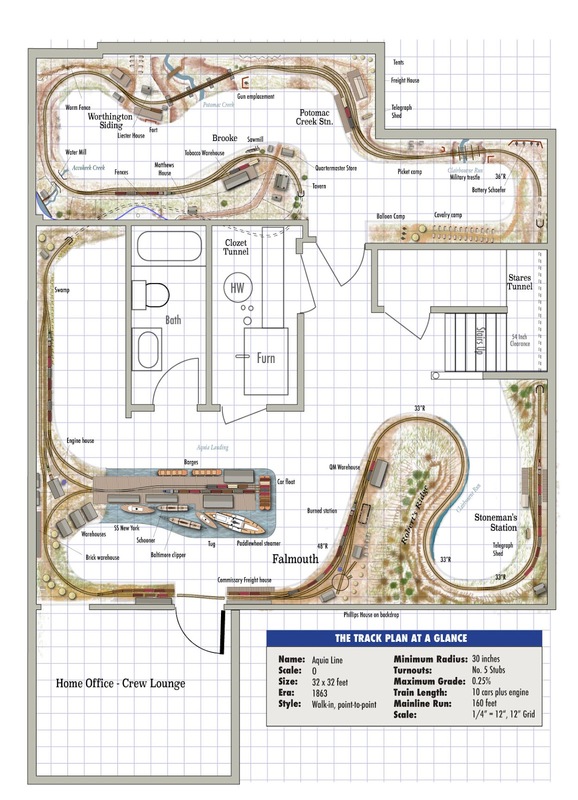 Later, I did a room filling layout design of Bush Terminal for my first track plan book. Last year, I visited Tom Fausser's HO scale switching layout in Tulsa. It's a large Brooklyn, NY theme layout that includes Bush Terminal. The photo at the right shows his work in progress as of 2017. It is a neat layout. I'd like to get a chance to operate it some day. I just got back from Sound Rail 2018 where I had a wonderful time. The layout hosts and organizers put on a great event. 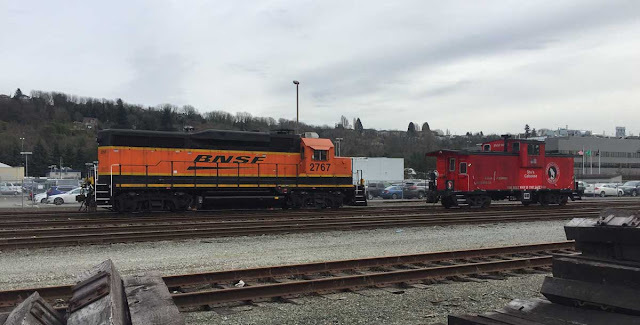 I arrived on Wednesday and did some rail fanning in downtown Seattle. I checked out the S Lander Street area near the Mariner's and Seahawk's stadiums since one of my friends is interested in modeling that area. Then I looked around the Harbor Island area. That would make a great core for a waterfront themed layout. That evening Kirk Reddie had an open house for his N Scale Milwaukee Lines east layout. To say it is a huge undertaking is an complete understatement. I don't know the exact dimensions, but it fills the bottom level of his purpose built home which also acts as his business and warehouse. It is probably over 3,000 square feet and will include multiple decks. Whew! It might be the biggest home ever if he and his crew complete it. Over the next three days I attended 4 operation sessions and 4 open houses. 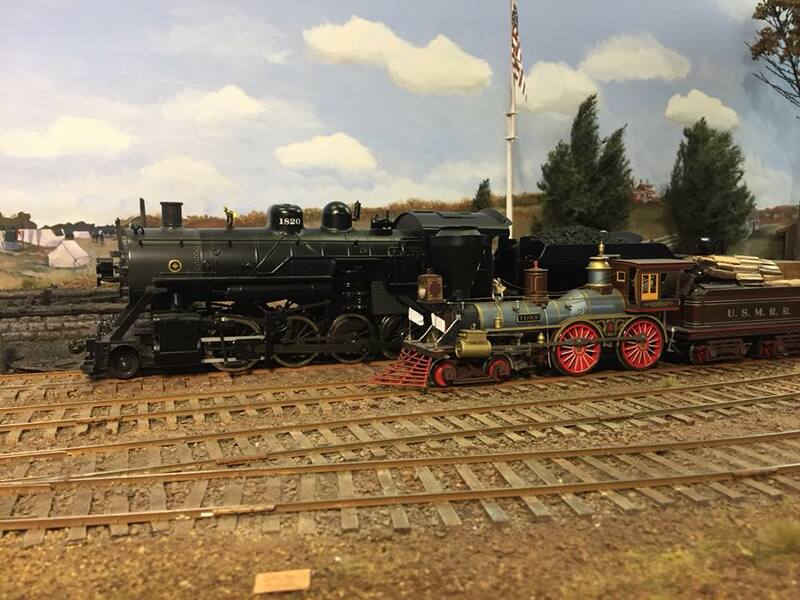 The video below summarizes the layouts I saw and operated. 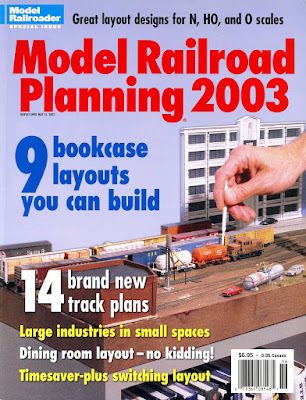 I tell my wife that the model railroading hobby is a big tent. Going to events like this shows you that there are many ways to build and operate a layout. 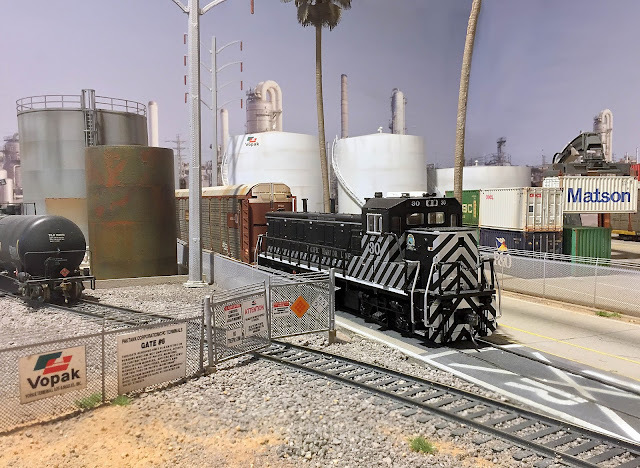 Mike "Chooch" O'Connell's P48 O scale layout is a perfect example. It is a massive, multiple level, mushroom style layout (it's actually much more complicated than a mushroom design - tracks are stacked 6 levels high in some sections) with theater style lighting. It felt like operating trains in a Disney exhibit. While not complete, the novelty of the design and the finished scenery shows that it will be a spectacular achievement when further along. John Barry stopped by on Saturday for mini work session. 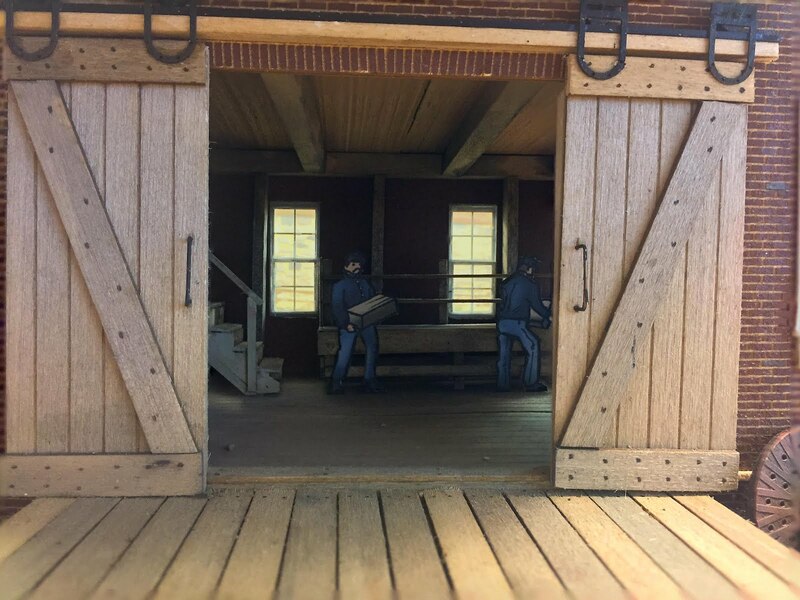 He got to work adding glazing to windows for the warehouses on Aquia Landing. I had pre-painted them, so it was just a matter of adding the glazing. There were about 80 windows that need glazing and John got most of them done. In the meantime I did various tasks. First I added a car card box and shelf to the Burnside Wharf area. I have initially grouped the cards for Aquia Landing and Burnside's Wharf in one box. But after a few op sessions, it seems like a separate box at Burnside Wharf might make things easier for my operators. I also made a new car card box for Aquia Landing that fit the fascia better. I then spent a good part of the rest of the weekend working on the passenger car. I decided to rebuild the roof. The first roof I made was warping because the joists were not glued to the roof decking. So I made new joists and purlins. 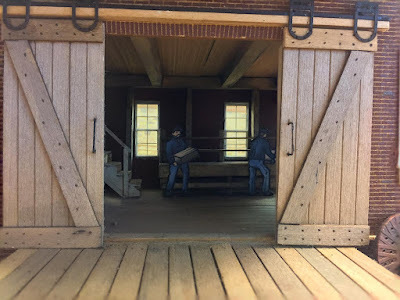 I also cut a new roof deck from 1/32 basswood. I added scribed lines to create the look of planks, but to also to kerf the the wood roof to curve easier. The top surface of the roof is a piece of paper secured with spray glue. The new roof fits tightly with no warp. It also looks cool when the roof is off. I finished the rest room details and added the steps, railings and some other minor details. The decals are from a set I had made several years ago.